1 in 5 Georgians – are food insecure, meaning they don't always know where they will find their next meal. This is well above the national average of 15.9%. In many ways, America is the land of plenty. But for 1 in 6 people in the United States, hunger is a very real struggle. Many people believe that the problems associated with hunger are confined to small pockets of society, certain areas of the country, or certain neighborhoods, but the reality is much different. Right now, millions of Americans are at risk of hunger. These are often hard-working adults, children and seniors who simply cannot always make ends meet and may be forced to go without food. Research has shown that food insecurity and hunger are serious threats to children’s health, growth and development. The nation’s economic growth depends on the well-being of our children. As such, the existence of childhood hunger in the United States threatens future American prosperity. Feeding America’s mission is to feed America's hungry through a nationwide network of more than 200 member food banks and engage our country in the fight to end hunger. Our friends at IKEA has partnered with Feeding America, the nation’s largest domestic hunger-relief organization, to sponsor an in-store program which supports national children’s hunger programs. These include giving free meals and snacks to low income children, as well as giving out nutritious easy-to-prepare food for children to take home on weekends – AND other programs to meet the needs of hungry children. 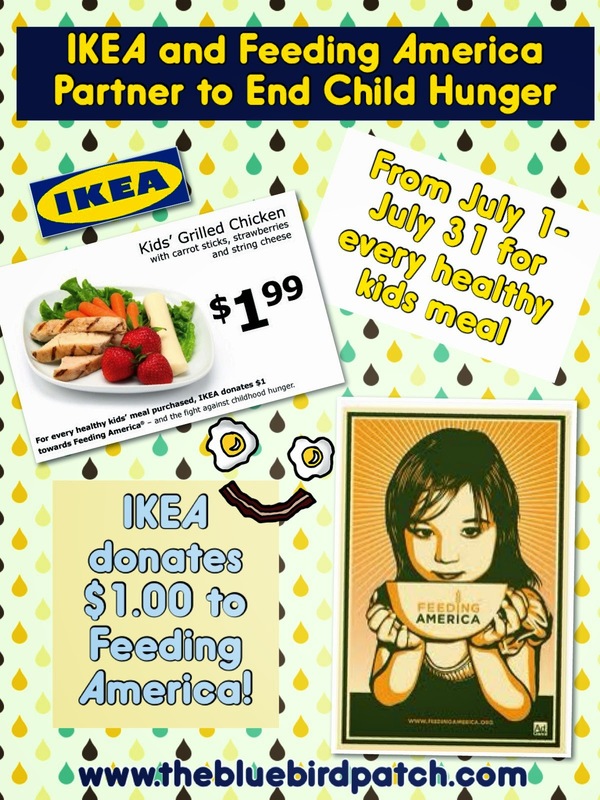 Running from July 1 – July 31, 2014, the Feeding the Future IKEA US program will donate $1 to Feeding America for every healthy kids meal purchased in any IKEA US restaurant. Additionally, IKEA customers can add donations of their chosen amount to food purchases in the IKEA restaurant, Swedish Food Market and Bistro. All added donations also will go to Feeding America. 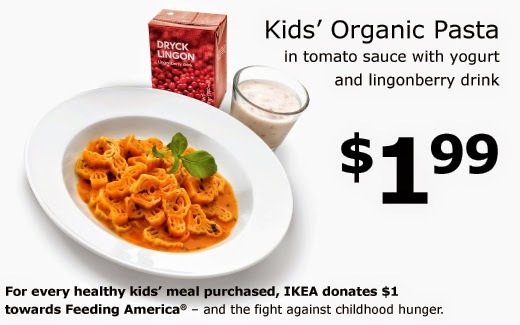 * The two healthy kids meals in the Feeding the Future program include moose shaped pasta in tomato sauce, yogurt and a lingonberry drink. Or grilled chicken with carrot sticks, strawberries and string cheese. Each meal costs only $1.99. “We’re in a city where our customers like to make a difference, Atlanta will help us improve lives and impact hunger in Georgia” commented Deidra Cunningham, IKEA Atlanta PR Manager. The mission of the School Based Pantry Program is to help alleviate child hunger in America through the provision of food to children and their families at school. Kids Café programs provide free meals and snacks to low-income children through a variety of community locations where children already congregate during the afterschool hours—such as Boys & Girls Clubs, churches or public schools. The mission of the Summer Food Program is to meet the needs of hungry children in the summer by providing them with nutritious meals and snacks when other resources are not available. The mission of the BackPack Program is to provide children facing hunger with nutritious and easy-to-prepare food to take home on weekends and school vacations when children are most at risk.